Cuba is still very much a developing country. It seems that the vast majority of facilities and services for the most part remain rather basic if not at times a bit rustic. In many ways a visit to Cuba is like going back in time. Think 1950s cars, horse carts, very limited internet access, and of course no Starbucks or McDonalds. Some may be challenged by this type of cultural experience but most find it to be part of the charm and wonder of travel to Cuba. 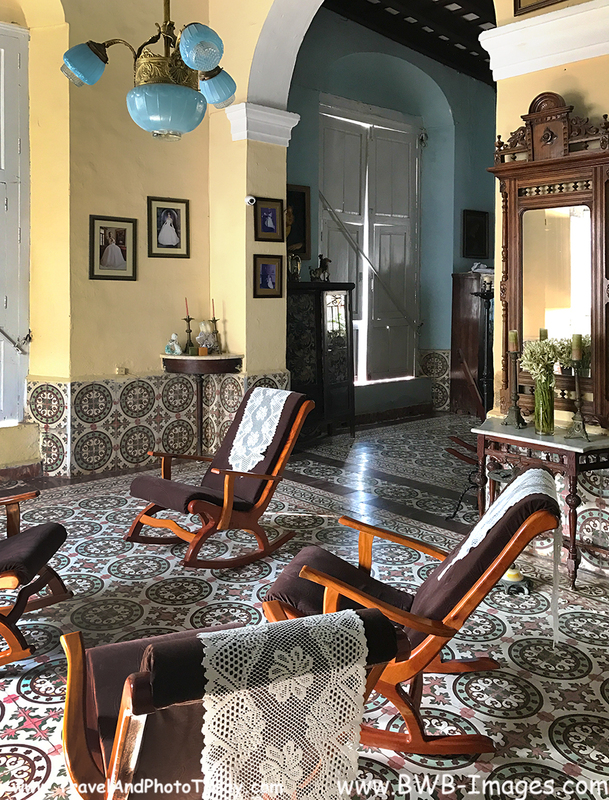 Even with Cuba’s somewhat basic economy, travelers to Cuba can generally find accommodations to fit their taste and travel style. There are many ways to approach finding accommodations in Cuba. With effort you can find lodgings ranging from the quite luxurious to more moderate and of course budget solutions to the accommodation challenge. Here are some of the options available. Travelers who want to get a taste of Cuba without the hassle of finding in-country accommodations frequently select a cruise. Many cruise lines offer Cuban itineraries including Carnival, Royal Caribbean and Viking Cruises. 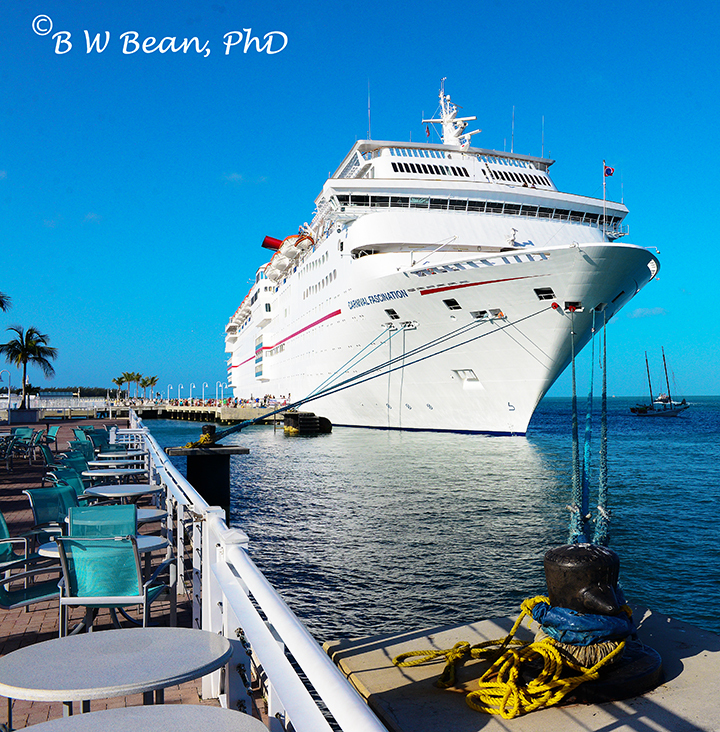 Cruising offers various advantages. You can visit a variety of coastal cities of Cuba without the need to arrange ground transportation or accommodations. You can spend the day in a Cuban city and then return to your ship with all the creature comforts you are used to. It is sort of like visiting a foreign land without really leaving home. Cruisers get all the services of the cruise line including quality staterooms, great food, entertainment and pre-arranged tours in ports of call. 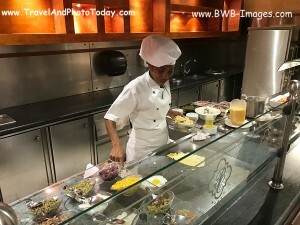 It’s a way to enjoy a lovely cruise experience and simultaneously get a brief taste of Cuba while operating from the comfortable “safe base” of your cruise ship. For some travelers this is a great option. But it is likely not the best option for those looking for a more in-depth or immersive Cuban experience. 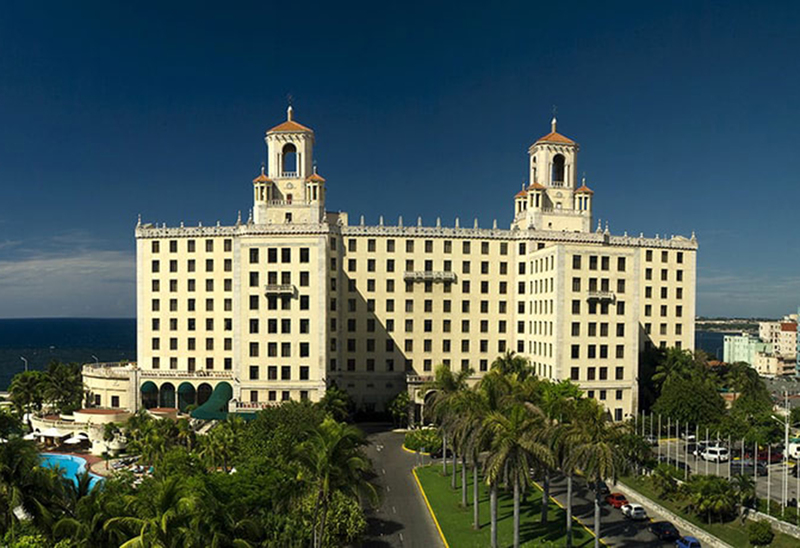 The Hotel Nacional de Cuba, is an historic luxury hotel located right on the Malecon in the Vedado area of Havana, Cuba. It’s been around since 1930 and has seen much of Cuba’s recent history including rebellions and Castro’s take over of the country in 1959. During it’s halcyon days it was “the” place to be in Havana, hosting the famous and infamous from around the world who enjoyed the sumptuous suites and the luxurious casino. Tourism disappeared from Cuba following the revolution and the hotel declined. Anti-aircraft guns were installed on the site and an extensive series of tunnels were built under the property during the era of the 1962 “Cuban Missile Crisis”. As Cuba has now reopened to tourists the hotel has been gradually restored and improved. Double rooms can be found here for around $225 although the hotel has larger rooms and suites with prices ranging into the $400 range. Even if you choose not to stay here it is worth a visit – have a drink in the garden bar and soak in the history. The Iberostar. 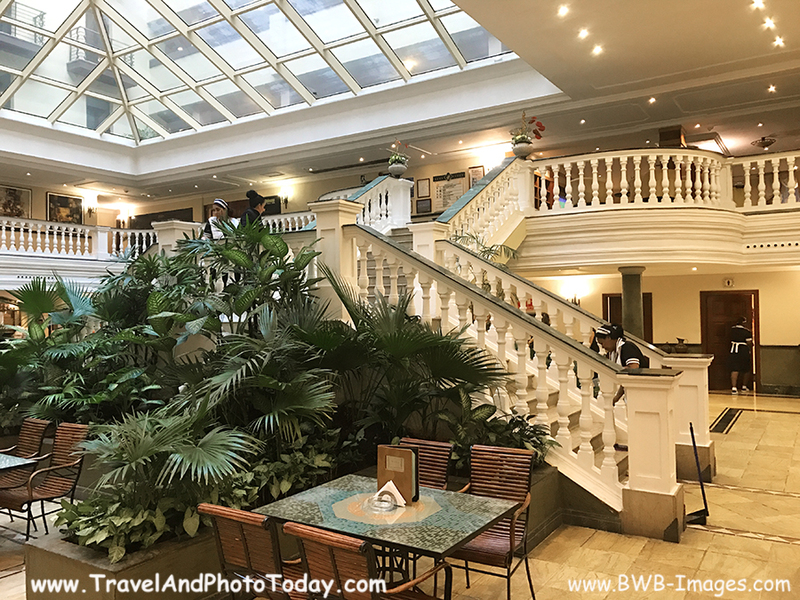 Located across from Parque Central and only about a six minute walk from the capitol, the Iberostar is a very nice and centrally located hotel in Old Havana. According to the desk they have rooms starting at $128 which includes breakfast and WiFi. The lobby is spacious and well maintained with good WiFi reception (not always the case in some hotels). The lobby also has great air conditioning so it’s a nice place to relax and escape the heat of the city for a mid-day drink or snack. The Breakfast Buffet is lovely with many offerings including made-to-order omelettes and waffles. It’s included with the room or can be purchased by visitors for $15. Booking a hotel in Cuba can present challenges at times. It can be difficult to book hotels directly via the internet. It’s always worth a try but internet access is limited in Cuba and spotty service impacts individuals and businesses alike. Frequently it is easiest to use an on-line booking company such as Trip Advisor or Booking.com. They will handle the direct bookings for you and in some cases their reservations may be a bit more reliable than if you attempt to deal directly with the hotel. 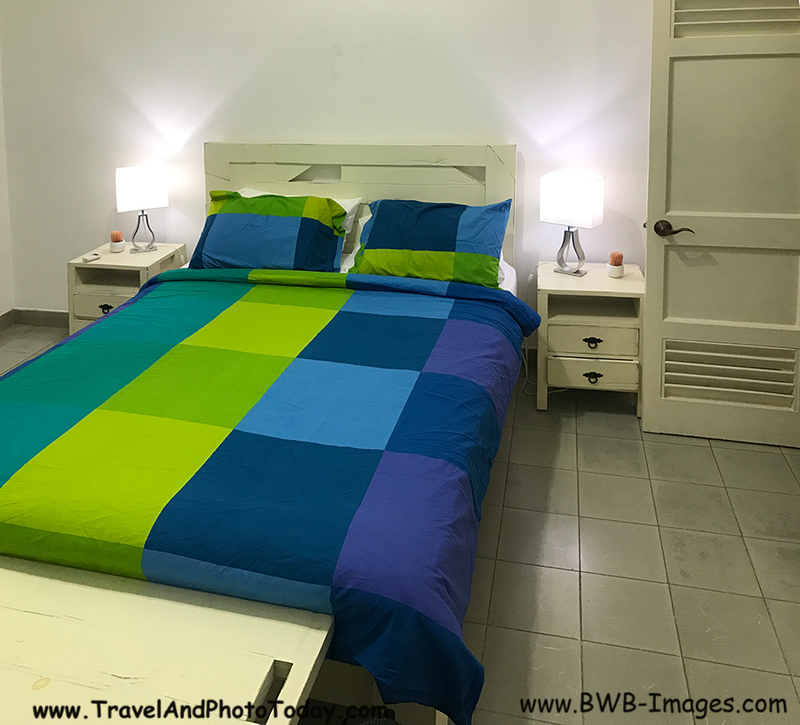 If you enjoy independent travel and like the idea of finding your own way and doing your own thing, you might consider short stay apartments in Cuba. Cuba has become more open to tourism in recent years. In response, entrepreneurial Cubans are moving rapidly to provide for tourists’ needs. Today there are an increasing number of apartments, condos and even free standing homes which have been updated, furnished and outfitted specifically for rental to visitors to Cuba. Rent for one night or rent for a month. 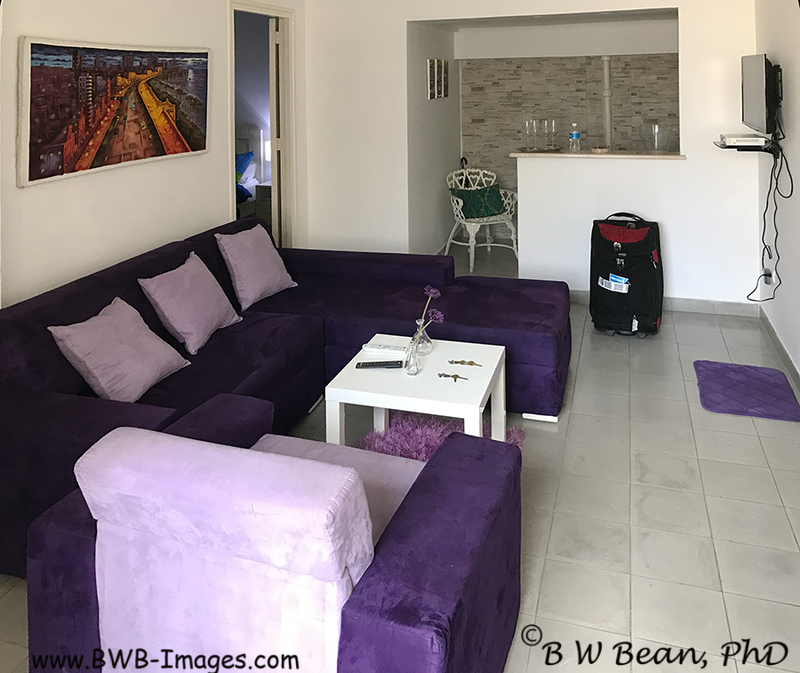 Apartment Living Room in Havana – Love the Purple! Short stay apartments are most easily arranged on-line prior to arrival in Cuba. Many of the standard, go-to rental sites including AirBnB and Owner Direct now offer Cuba rentals. With a bit of searching travelers can find a variety of great short term stay apartments. 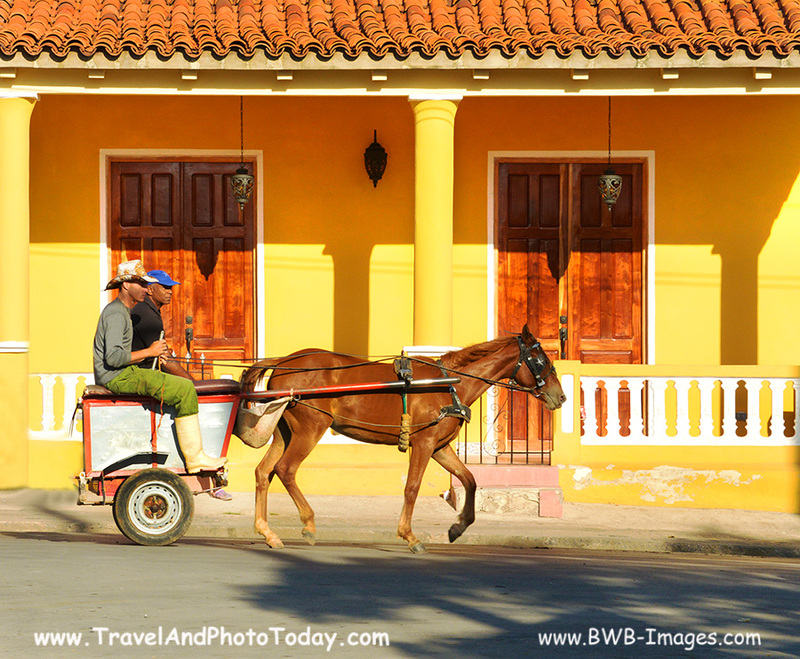 Be sure to check the details of the listing – it’s best not to assume anything about Cuban travel. Many apartments are equipped with modern beds, plumbing, electricity, air conditioning, telephone and furnishings as well as an equipped kitchen with at least a hot plate, refrigerator and cooking and eating utensils. Some even include washers and dryers. A short stay apartment works best for travelers who want to explore Cuba in their own way and at their own pace. They give you a chance to live like a local, shopping in the markets, eating in local spots and getting to know a neighborhood. They do not offer concierge services, a bellman or the other travel support systems found in hotels. “Casa Particular” translates to “private house” in English. However the meaning in Cuba has changed since the government began allowing Cubans to rent out their homes or rooms in their homes in 1997. Today the term “Casa Particular” in Cuba refers to rental lodging which is privately owned. So technically today “Casa Particular” actually refers to a privately owned rental unit which could be an entire home, an apartment, or rooms within a private home. Short term stay apartments such as the ones mentioned above could therefore be referred to as Casa Particulars. However most traditional “Casas” are not simply houses or apartments for rent. Rather, most Casa owners are actively involved as hosts to their guests. Aside from a basic room or rooms with bath, owners generally offer to prepare breakfasts and dinners for additional charge. The host family frequently lives either in the same building or close by and visitors have the opportunity to interact with the family. The family can also help arrange activities, transportation or offer insights about the area – things to do, the best restaurants, etc. Staying in a Casa of this sort can be a fun way to have more personal contact with the Cuban people and the culture. Opening their home to travelers gives the host family a chance to meet people of the world. 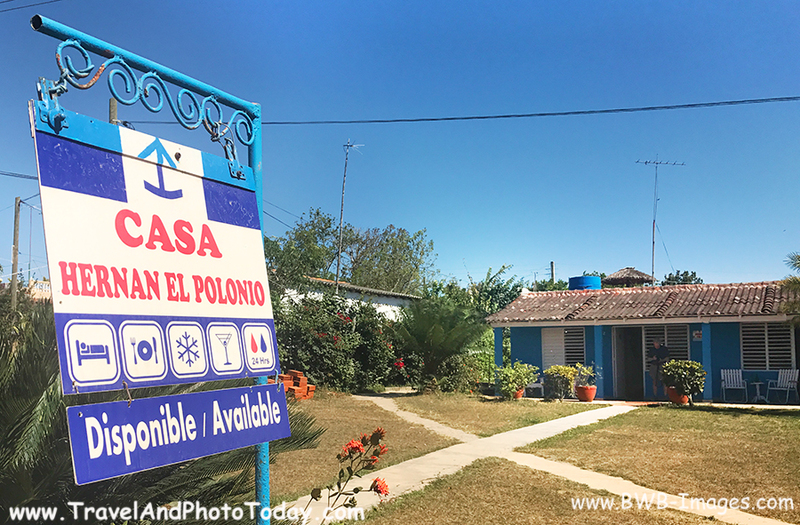 It also provides some much needed income in an economy where people make very little in their “day job.” The traveler’s experience in a Casa is better if they speak Spanish as there is no guarantee that your host will be fluent in your native language. However there is generally someone in the household who speaks a bit of English. That, in combination with lots of good natured “sign language,” generally is enough to keep communication flowing, if only at a rather basic level. Staying in a family oriented Casa also allows you to be closer to the community and to get a feel for the culture and lifestyle. Many people say staying in a family oriented Casa is the only way to go. I tend to agree. There are many ways to book a stay at a Casa. If you are pressed for time and want the security of knowing that you have a confirmed reservation you can book many Casas through AirBnB or other on-line booking sites such as My Casa Particular and Homestay.com. This might also be best if traveling during the high season when there is more demand for Casa accommodations. If reservations are important I’d suggest booking through a well established site. There are many stories from travelers who have booked locally and have arrived only to find that their room had been given to another traveler who arrived earlier. (To some degree it appears that Casa operators, in need of income, at times operate on a “first come / first pay – the room is yours” basis. ) Apparently in such cases the host helps the “bumped” travelers find other similar accommodations. But that can still be a hassle. It’s good to know that most Casa Particulars have a name as well as an address. While people may not be able to help you find your Casa using the street address they will likely immediately recognize the name of the Casa and be able to give you directions. Also, if you are looking for a Casa for the evening be aware that most display a sign out front with their name and the services they offer. They also display the symbol seen at the top of the sign in the photo below which indicates they are a Casa. In some cases all you will see at the home is the symbol. If you see the sign – feel free to walk up and enquire. Casa prices vary greatly depending upon location, space, amenities and service. Basic rooms with bath start around $10 or $15 per night for a basic room and go up from there as amenities improve. Prices are somewhat negotiable if you are booking in person as the host really wants your business. Prices tend to be a bit higher if booking on-line but that cost is offset by being reasonably assured of having a reservation and a place to stay. Booking accommodations via Airbnb has worked very well for me on journeys through Europe. I booked my Cuba stays with Airbnb and it worked out great – highly recommended. Use my Free Referral Coupon for $40.00 credit for first time Airbnb Travelers – Just CLICK HERE! 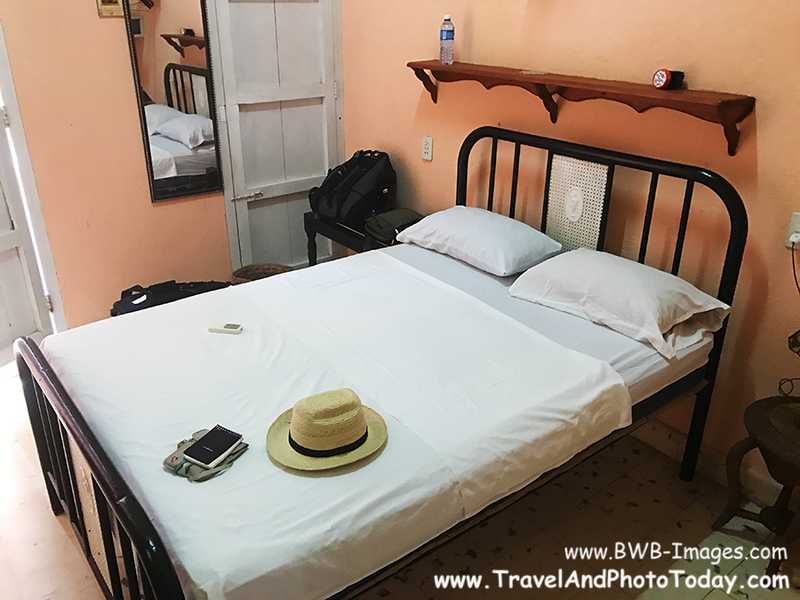 Bottom Line – Cuba is a great destination and you will find a variety of accommodations to fit your own travel needs and style. As always, a bit of advanced research will be helpful. VISIT CUBA……..AND ENJOY THE ADVENTURE!